A common complaint about transit in New Jersey is that there is no official map with bus lines. New Jersey Transit provides maps of its commuter rail and light rail lines, New York Waterway has ferry maps, and the Port Authority provides maps of its PATH trains, but nothing for buses. Part of the problem is that New Jersey Transit runs a lot of buses, and a bus map of the entire state would be incredibly expensive to produce and hard to read. Still, it's kind of silly that they just throw up their hands. The MTA produces maps for each county that they serve, and the Paris RATP makes a great series of bus maps by department. So it can be done. Since 2008, Doug Kelly has been developing, updating and maintaining an impressive set of Google maps of New Jersey Transit buses (and one of Nassau County to boot). But the other day I was thinking about our frequent network maps discussion from last year, where I made a map of the most frequent routes in Queens. I realized that I don't really want to know about New Jersey Transit Route 120, which doesn't even run all day. Like most people, I want to know the frequent routes. The vast majority of bus routes are run by New Jersey Transit, but if you've been reading this blog you'll know that there's a large network of privately operated buses, especially in Hudson County and the Route 4 corridor. Many of these buses run on a jitney system, without a fixed schedule. They either wait at one end of the route to fill up before going, or they operate on the driver's best guess as to whether they'll be able to make a profit on the run. How do we know what that is for a given route? Sit out on a street corner with a stopwatch? Fortunately, we don't have to. 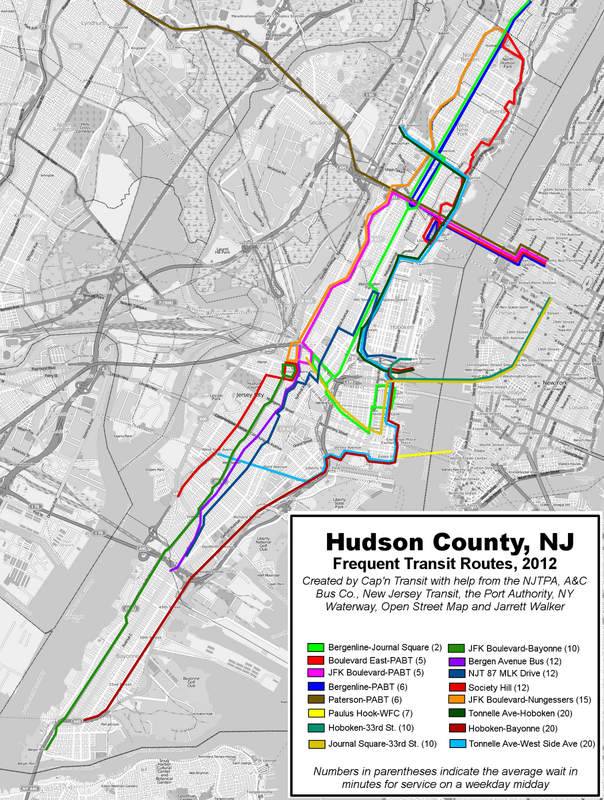 Unlike official transit planners in New York City who completely ignore jitneys, the North Jersey Transportation Planning Authority hired AECOM to study the jitneys of Hudson County in detail. Their report is a thing of beauty, and yes it contains frequency counts at different times of day. It also contains a list of all the bus lines that they know of in Hudson County, so I looked them all up on the websites of New Jersey Transit (though it's actually easier to google "NJ Transit" and the route number than to use their clunky interface), the A&C Bus Company, and others, and compiled a list of weekday midday frequencies, and a map to go with them (sorry about the colors). I was blown away. I knew that the NJTPA report listed the Bergenline vans as coming every two minutes, so I expected there to be van routes at the top of the frequency list, but I didn't think that the top six most frequent lines would be van lines. I also didn't expect that the Hudson-Bergen light rail would come so infrequently that if you're going to Hoboken you may have to wait up to twenty minutes. I didn't even expect the PATH trains to be every ten minutes during middays. Most significantly, I didn't expect to find no New Jersey Transit bus route in Hudson County that comes more than once every twenty minutes during the middle of the day. But that actually makes sense if you remember that they're actually forbidden from engaging in "destructive competition" with a private operator, so in the terminology of Klein, Moore and Reja, when there's a thick market they step back and provide only an anchor. Still, it seems to me that in thin markets like everything west of the Hackensack River (Secaucus, Kearney, Arlington, East Newark and Harrison) they would provide more frequent service, but apparently not. Another thing: these buses run frequently all day, and fill up regularly, without subsidies, and they only have one feature of "bus rapid transit": the Lincoln Tunnel Exclusive Bus Lane in the mornings. No iconic stations or distinctive branding. To be honest, many of them are slow, particularly on Bergenline Avenue. But people take them anyway. A final note: I worked primarily by corridors, so I didn't include services like the Newark-WTC PATH train, the Broadway Bus and the buses that come every twenty minutes when they're the only service in that corridor. I did, however, include services like the Hudson-Bergen Light rail where interlining makes the vehicles more frequent than once every fifteen minutes. How big are the vans/buses that run north-south in the county? Are they as big as a regular bus, or only as big as a minivan? They're much bigger than minivans. On Bergenline and Kennedy they tend to be 20-30 passenger cutaways. On Boulevard East I'm seeing more and more 40-passenger cutaways and school buses, like in the photo in this post. I can see where you're going, and the capacity is probably lower than the light rail and definitely lower than the PATH, but you can't beat the frequency. Show up on Bergenline and you can get on a bus right away - as long as they're not full, which they aren't usually in the middle of the day. Okay, second question: do you know how far north the buses go? The natural anchor to the north is GWB Plaza, but density starts to drop at the county line. Good question! I've revised the map to show that the Bergenline buses continue north through Fairview. All of the buses from the Port Authority and some of the ones from Journal Square turn around in the parking lot of the A&P at the Cliffside Park town line. Some of the Journal Square vans continue north to Bridge Plaza in Fort Lee, and a significant number go across the George Washington Bridge to the terminal at 179th Street, but I don't know the frequencies. I would just like to point out some oversights on your part where NJ Transit (either a single route or a coordinated headway) offers a 15 minute or better headway on weekdays during the midday. 1. 10 to 15 minute frequency (usually 12) on #87 between southern Jersey City and Hoboken - entire route(van competition on a small segment only). 2. 15 minute headway on #84 - Journal Square - Nungessers (North Bergen) via Bergenline between Journal Square and 30th Street in Union City (major transfer to buses heading west out of Hudson County) - heavy van competition. Additional service between Journal Square and a portion of Palisade Ave. in Jersey City by #87. 3. 7/8 minute headway on Bergenline Avenue between Nungessers and 48th Street Hudson Bergen Light Rail Station and 15 minute or better headway continuing to 31st Street and transfer to buses heading west out of county. (#22 to Hoboken leaves Nungessers at :10 and :40; #156 to PABT leaves at :17 and :47; #84 Bergenline trips to Journal Square leave at :25 and :55; and #159 to PABT leaves at :02 and :32. The #156 turns at 48th Street creating the 15 minute gaps south of 48th St.)- heavy van competition. Okay, so instead of hinting it, I'll come out and say it: what reason is there not to build a "Jersey G," going mostly under Bergenline from GWB Plaza to Journal Square? Busplanner, if that's oversight on my part, it comes from trusting the NJTPA study authors, who don't mention the #84 or #87. I'll put the #87 on the next map. I also considered the 165/166 on Boulevard East. But in Hudson County, those and the 84 run on streets parallel to the vans, and the vans run much more frequently. I mainly left them off to reduce clutter. Well, I wouldn't say no to a Bergenline Avenue subway, Alon! And I would run it across the GWB to Washington Heights. But I'm guessing that the people who live on top of the ridge there don't have much political power, so the politicians don't see much reward. @Cap'n - I excuse you if you relied on the NJTPA Study authors for your route and frequency information. But that raises an interesting question. If they could miss routes like the 84 and 87 (and, I assume other NJ Transit routes that compete with vans; but have only a 20 minute headway midday; how accurate are there frequency counts for the vans, especially since the vans do not print schedules? You haven't read the study yet? Go do it! It's well-written and relatively short. They got the frequency information for the vans by sitting there with a stopwatch. It may not be completely accurate, but it's probably good enough. Check page 4 of the report. NJ Transit routes 84 and 87 are in the frequency table, which is organized by intra vs. interstate, by corridor, etc. The Jitneys, while leaving a lot to be desired in terms of cleanliness and comfort, put NJ Transit buses to shame. The best route in Hudson County is probably the 87 due mostly to the relative brevity of its route (JSQ to Hoboken Terminal). Other lines are terribly unreliable. You also have entire stretches of the county that arent accounted for by any public transit besides the jitneys. The light rail was constructed in the least efficient but most politically expedient way possible to link the Gold Coast with the planned Xanadu uber-development in the Meadowlands and has caused consternation by making it very easy for kids with bad intentions to commit crimes in one part of the County and have a fast and easy escape. Many people wont take the light rail after 8 or 9 pm due to the knuckleheads who hang out on it late at night. Because the stations are so remote in some places, people feel very unsafe and isolated. Cap'n: my personal fantasy is to extend the C to Paterson mostly elevated over Route 4, and then make the Fort Lee-Journal Square line something like a Jersey G. Only without the sucking. While I would rate the study overall as good, there are numerous errors and sins of omission, from the minor ones that creep into most consultants work to some fairly major ones such as being too lazy (for lack of a better word) to obtain the Montgomery and Westside spans and frequencies. You had a link to these in your posting under A@C Transit (which is the other half of the company's operations). @kleptopaul - The #87 is a longer route than you suggest. It operates beyond Journal Square to Gates Avenue in southern Jersey City, a few blocks north of the Bayonne border. 1. 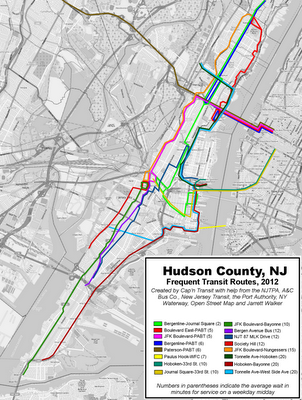 What jitney routes serve parts of Hudson County not covered by conventional bus routes? The report does not discuss any. What evidence do you have that Hudson-Bergen Light Rail is to be extended to Xanadu (now American Dream)? The Meadowlands Rail spur off the Pascack Valley line is designed to serve that market. I didn't expect to find no New Jersey Transit bus route in Hudson County that comes more than once every twenty minutes during the middle of the day. The 10 runs every ten minutes. I didn't go looking past that. I suspect the busy routes serve Journal Square. The schedule for the 10 notes all the buses you can transfer to. You can transfer to PATH at Journal Square and the 1, 2, 6, 43, 64. 67, 80, 83, 84, 87, 88, 119, 125 and 319. I'm not going to go look but if bus numbering logic in Hudson County follows bus numbering logic in the rest of the state the 119 and the 125 are interstate routes or maybe long distance intrastate routes and the 319 is a shuttle to an employment center in the 'burbs somewhere. ... The 1 runs all the way to Ivy Hill in Newark. I'm not going to go look, once every ten minutes during the day kinda line, between Penn Station and Ivy Hill anyway. Like lots of other bus routes in Newark. Or the 10 in Jersey City and Bayonne. Still, it seems to me that in thin markets like everything west of the Hackensack River (Secaucus, Kearney, Arlington, East Newark and Harrison) they would provide more frequent service, but apparently not. There's a great big swamp in the middle of Hudson County. Not many people want to go to the swamp. The people west of the swamp, even though they live in Hudson County are in suburbs of Newark, not Jersey City. To them it's a very suburban place, they drive to most destinations not in walking distance. Thanks, Chris and Busplanner! Turns out that I missed a whole page full of NJ Transit bus routes. But when I looked at them, only one had midday frequencies below 20 minutes: the #87. Adirondacker, the #1 only runs once an hour to Exchange Place, and once to Journal Square. The #10 runs every 20 minutes middays, but I put the Kennedy Boulevard south corridor on there because the report says that there are also vans that run every 20 minutes midday. Between the two, frequency is probably every 10 minutes on average. I've updated the map to add the Kennedy and #87 routes. Please refresh if you don't see them. Alon, I think Route 46 is a better route in Fort Lee/Palisades Park, and then the trains can hook up to the Suzy-Q to Paterson. It's just awful that NJTransit runs the number of buses needed on a route instead of the number of buses that you, by looking at map, think should be running. Positively atrocious that the 10 starts running at 4:30 AM and the last bus leaves at 2:30 AM, only 22 hours a day and that it dips down to every 20 minutes a when demand is low. The 1 runs once an hour between Newark and Jersey City because no one wants to go to the swamp. If they live in Ivy Hill and want to get to Exchange Place they get off at Penn Station and take PATH. ... and no one in Paterson, unless they have a masochistic streak is going to take a train to Washington Heights so that they can transfer to the A when there's a frequent bus at the corner that takes them the Port Authority Bust Terminal and Times Square. I didn't say anything about it being awful, Adirondacker. This is a Frequent Network Map, and those lines are not frequent enough for the map. Other lines are. That's how it works. A bus that comes every 30 minutes midday is not frequent. Even with local stops on Route 4 you do Paterson-168th in about 0:33 (since those local stops are still much farther apart than Manhattan subway stops), and if half the trains run express with timed overtakes or something then you can push 0:25. Add this to 0:23 168th-42nd (on the C) or 0:18 (on the A) and you get better travel time than on the bus, plus service to Garden State Plaza and Bergen Town Center, Fort Lee, Washington Heights, Columbus Circle, etc. Can anyone suggest where to complain or get accurate information as to what is happening on the 88 bus on Kennedy Blvd.? I think they are short of drivers and there are long stretches of time (up to 45 minutes or more) without any buses. Very frustrating! I haven't been back to North Jersey in some time; but I just looked up the No. 88 bus schedule. Some pretty wicked service reductions, especially off=peak and weekends, were made about a year ago. To make matters worse, in the Jersey City portion of the route during many times of the day, alternate trips operate on Central Avenue in Jersey City instead of on Kennedy Boulevard, creating one hour gaps in service on Kennedy Boulevard in Jersey City. So, if you need to get to/from the Kennedy Blvd. section of the route in Jersey City (and cannot use the No. 2 or No. 125) and choose not to walk to/from Central Ave. at the times buses use Central or to use the jitneys, you could be waiting for a bus for a long time. If this is the case, I would suggest you complain strongly to NJ Transit and demand an explanation. I personally think that 12-15 minute headways make a huge difference in commuting over 20-30 minute headways, so I would be interested in a map that showed those. There is at least one (possibly two depending on interpretation) routes in New Jersey that operate a 10-minute midday weekday schedule missing from your map. 2. In addition to the vans on Boulevard East in Hudson County, NJ Transit's combined 128/165/166/168 covers the same territory with a weekday midday headway of 10 minutes or better, if you don't consider this a duplication of the vans. Note: Until recently, there was some NJ Transit service in the Atlantic City area that operated on a 10-minute headway; but I assume with the recent casino closings, service was cut back. (Maybe it still operates on a 10 in the summer, as NJT beefs up many of their Jersey Shore routes after Memorial Day. I am interested in going from Fotlee NJ to 56th street in Kennedy Blvd.. is there any stop in fortlee from where the Spanish buses run to Kennedy? Raisa, I think you can take any of the buses from Anderson Avenue in Fort Lee to Nungessers and change for a Kennedy Boulevard bus. You can also stay on the bus to 56th and Bergenline and walk west to Kennedy Boulevard. How many Jakriborgs is that? Who's getting out of the way? Can we have real crosswalks in New York City?